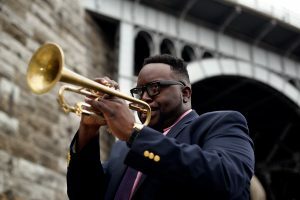 If you are at all involved in the jazz scene, you likely have heard the name Marquis Hill over the past couple years – he’s the definition of a “rising star” and “young lion” in the jazz trumpet world. 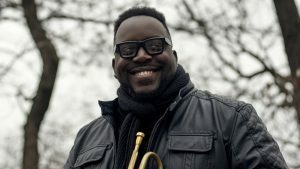 While being a sought after unique voice in his native Chicago jazz scene for years now, Marquis began to get the national/international attention he’s deserved recently after winning the 2014 Thelonious Monk Jazz Trumpet Competition (and International Trumpet Guild Jazz Competition in 2012). 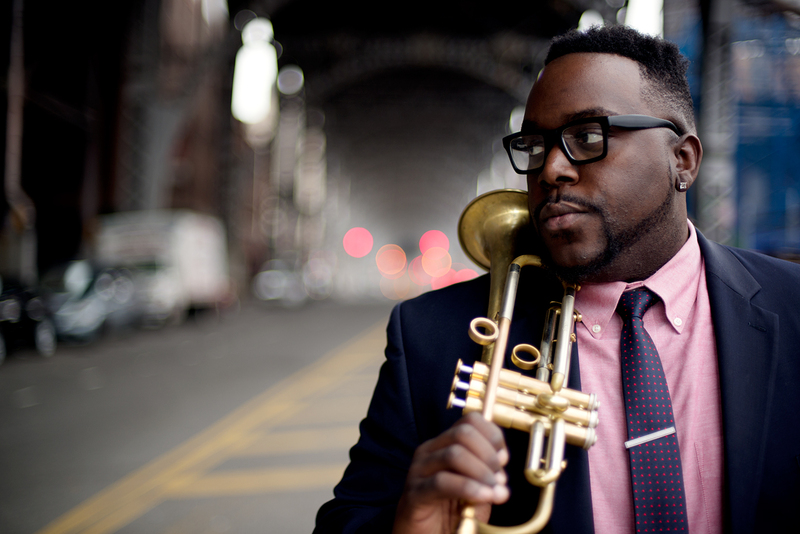 We’re excited to have him on the FONT Music team this year as not only an artist, but a curator of the event at The Jazz Gallery on September 26th entitled Signatures in Brass (buy tickets here). This is actually my first year involved with FONT; I discovered the effort about two years ago and have wanted to be involved with their good work ever since. I consider myself fortunate to be a part of it this year. Born and raised in Chicago, I was fortunate enough to learn and grow well in the city’s energetic scene. It has long had a number of authentic voices and artist that see artistic vision. Though currently splitting time between Chicago and New York, I’m ever grateful for the rich opportunities my home town has, and continues to offer. To learn from and perform alongside some of the city’s great thinkers in the music – Willie Pickens, Von Freeman, Fred Anderson, Ken Chaney, Ernest Dawkins, and Bobby Broom – is a blessing. Wow, a blessing for sure! Tell us about some of the professional stuff you’ve been up to. I’ve been involved with some pretty fulfilling projects over the past few years. Matt Ulery’s “Loom,” Juan Pastor’s “Chinano,” Geof Bradifield’s “Our Roots” have each been uniquely fine opportunities in which I had the the oppurtonity to grow and contribute. As of late, my main focus has been my working group, The Marquis Hill Blacktet. We released our latest project, “Modern Flows vol. 1,” last fall; currently, we are preparing to go back into the studio and record the next project entitled “The Way We Play.”So what’s next for you? Some great things are coming up; I’m energized to be playing the music from “Modern Flows Vol. 1” at the Chicago Jazz Festival, in September. Thrilled to be spending more time in New York – where I get opportunity to learn and grow with a number of compelling artists – I will also be doing a two-month European tour with the great bassist-composer-leader Marcus Miller, beginning in October. After that my focus will come back to the project to be released next spring (“The Way We Play”) Its an exciting and grateful time. That’s fantastic! Can’t wait to hear about the Marcus Miller tour – you’ll have to give us a recap of that when you’re back! Luckily, before you split for that FONT Music gets you on September 16th at The Jazz Gallery. Can you tell us a little about how you’ve curated this event? 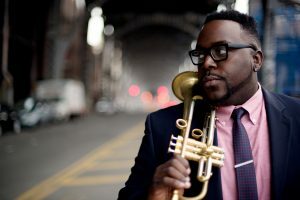 This is a project I call “SIGNATURES IN BRASS: The Personality-packed review of contemporary Jazz Trumpet.” It features Philip Dizack, Josh Evans, Keyon Harold, Ingrid Jensen, Billy Buss, and myself, on trumpets – as well as Theo Hill on Piano, Eric Wheeler on Bass, and Obed Calvaire on the kit. This is a great opportunity to feature a number of different and unique voices emerging under “Jazz Trumpet” umbrella. Featuring all-original music from the band as well as a commissioned piece – written by long time friend and fine composer, Kendall Moore. Should be a true fellowship! Purchase tickets to SIGNATURES IN BRASS here!